This paper outlines key areas in delivering the UK automotive industry’s position on the UK’s withdrawal from the European Union. SMMT’s position remains unchanged in relation to the five main priorities in this paper and builds on previous work to provide focus on what next steps the government should take to deliver on automotive priorities. 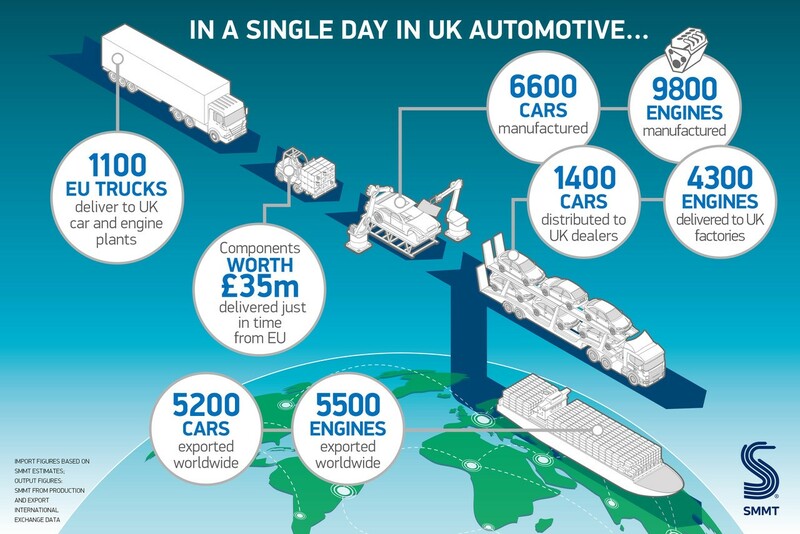 SMMT welcomes statements made by government in highlighting the importance of the UK automotive industry to the economy and a determination to prioritise the sector’s key issues as part of the UK’s negotiations with the EU. The Prime Minister’s January 2017 speech and government white paper outlined the basis and broad strategy for the UK entering negotiations with the EU. SMMT now calls on government to outline how it will deliver on the industry’s priorities to sustain business confidence, attract investment and secure the growth ambitions of the sector. Government must secure interim arrangements to safeguard the future of the UK automotive industry and avoid a cliff edge. Clarity and certainty is urgently needed for businesses to enable them to plan and secure investment following the March 2019 Article 50 deadline. SMMT calls on government to maintain Single Market and customs union membership until a final agreement on a new relationship with the EU has been agreed and implemented. Single Market – To achieve automotive priorities on tariff-free trade and avoiding non-tariff barriers, government must demonstrate how it intends to secure a future trade agreement with the EU that affords the automotive industry the benefits currently enjoyed as members of the Single Market. Customs – Under a new customs agreement with the EU, government should prioritise the free-flow of automotive goods at the border to avoid costs, maintain competitiveness and support the just-in-time manufacturing process. Key issues include continued application of common customs rules and procedures without burdensome checks or reporting. Talent – Government must address the needs of the automotive industry in its ability to recruit and access talent when assessing how the UK ends freedom of movement and implements new immigration controls. Key issues include access to labour to fill skills gaps and the current ability for automotive companies to quickly and easily move employees to address operational issues or support project teams. Regulation – Government should demonstrate how existing automotive regulation fits within plans for the ‘Repeal Bill’ and work through options for how future EU regulation affecting the UK automotive industry can be effectively implemented. Key issues include future influence on regulations affecting the UK automotive industry, the potential to create non-tariff barriers through regulatory divergence and the ability for the UK to type approve vehicles for the European market. Trade – Clarity is needed on how the UK will treat both existing EU Free Trade Agreements and those currently under negotiation. Key issues include establishing solutions to issues around Rules of Origin, understanding how existing preferential access to markets can be secured as well as benefits from regulatory discussions between the EU and other key markets. Read the discussion paper in full.